Getting dinner on the table in the summertime can be a little tricky to do if you want to keep your kitchen nice and cool. Using the oven to prepare dinner can make your kitchen unbearably hot for several hours, but most of us don’t want to eat sandwiches and salads every night. One great alternative that is especially great in the summertime is to use the slow cooker to prepare dinner. In addition to keeping your kitchen cool, the slow cooker can usually shave a lot of time off your dinner preparations and leave you more time for summer fun! 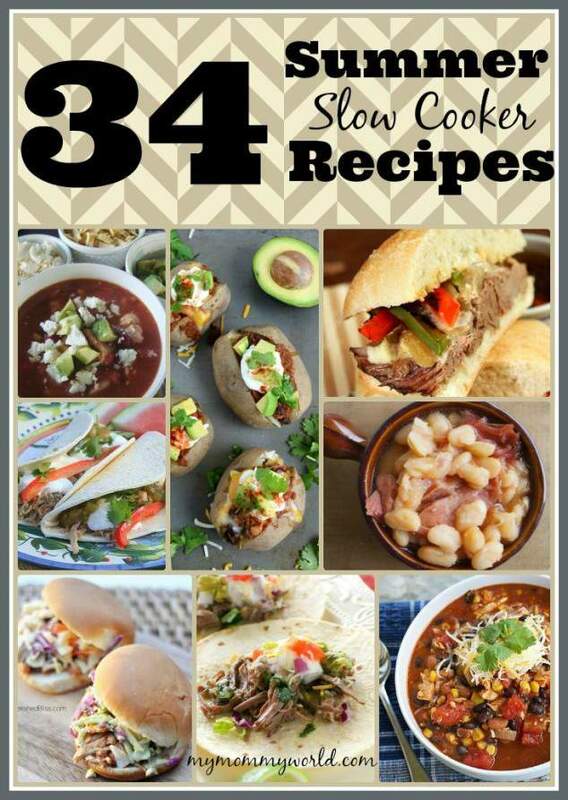 Here are 34 yummy summer slow cooker recipes for you to try out during the hottest months of the year, but don’t forget to try them out the rest of the year too…they work all year round! What’s your favorite slow cooker meal to make in the summer? So many great sounding recipes. I know I’ve been using my slow cooker more often. We like slow cooker beef and bean enchiladas and slow cooker lasagna quite a bit. Lasagna comes out so nicely in the slow cooker…I was so surprised the first time I tried it! It’s nice to be able to cook it with so little effort. There are so many great ideas in this list! Thanks for sharing it, Erin. Hope you can find something your family enjoys! I love my crockpot but have a little stumped on what to cook for more “summery” meals. Thanks for the tips! Stopping by from the link up!